I really like the deck, I tried to make a similar one but was never able to get it where I wanted it to be. Sea monsters all have really high cmc so I suggest ways to cheat them into play such as Genesis Storm , Genesis Wave , Selvala's Stampede , Tooth and Nail and See the Unwritten . 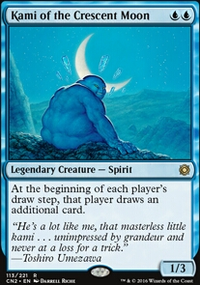 A deck full of high cmc creatures also needs a lot of ramp to keep up with other decks. 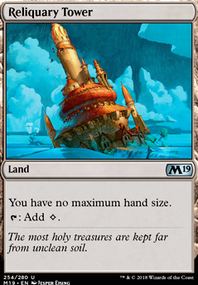 I personally think you should up your ramp package and add a couple more lands. 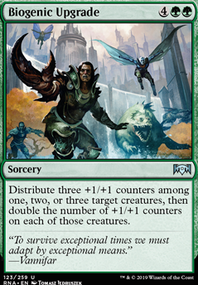 Frontier Siege is a card I really like, choose khans for 2 green main phase 1 and 2 more main phase 2. 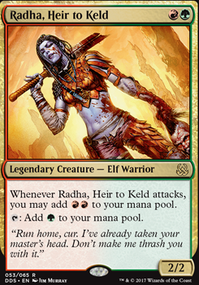 You are running Shamanic Revelation but I think cards like Rishkar's Expertise / Soul's Majesty are likely to draw more cards. You will probably more often have a creature with 5+ power out than 5 creatures on the board. 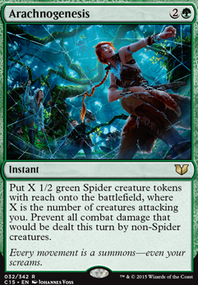 Fixing the top card of your deck is already a subtheme so it may be worth trying out Lurking Predators . Thassa, God of the Sea seems to do everything you want. Fits theme, grants unblockable, and helps rig your top card. Thanks for the trade. I placed 2 of the cards into bant enchantress deck, along with Omniscience I picked up in another trade. 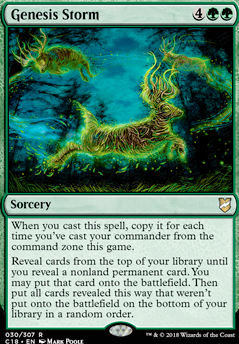 With two "enchantress" draw cards in play. I hit omniscience with a Genesis Storm (commander cast count 2). With Bant Charm and Arcane Denial in my hand to stop my opponents attempts to blow it up and rift my board. Drawing 2 when I cast any enchantment, I then built my board up until I had lethal unblockables on the field. Two opponents scooped. Last opponent cast Reins of Power , so didn't win that turn. On his turn, He cast Niv miz and cast a wheel, I rifted his niv miz, he counters my rift, so I Capsize his niv miz. He then scooped as he couldn't kill me, or stop me from killing him. Not sure what you mean by Starfield of Nyx being counter-intuitive. 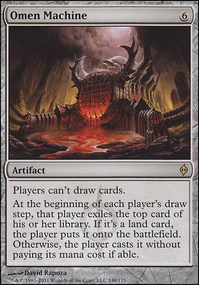 It's a solid card at any point in the game and provides a large number of blockers or a backup win condition should you need a little extra firepower. 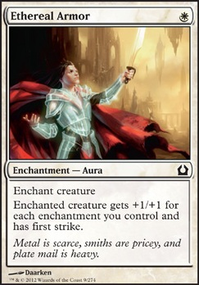 Myth Unbound - it's just not that exciting of an effect, even if it provides some minor incentive not to remove your commander. Ajani's Chosen - I tried this in my enchantress deck and found it lacking. The vanilla 2/2s it creates don't really make a difference and there are better turn four plays. Compare with Sigil of the Empty Throne which creates large flying bodies--a card I've found invaluable. Genesis Storm - I'm not wowed by these commander storm cards--they cost far too much mana for what you get. 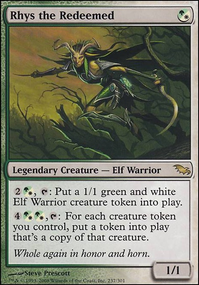 For them to really "shine" your commander has to have been removed and recast a number of times, so you're probably far behind and these are just not powerful enough to catch you up. Honestly, I'm not impressed with Kestia, the Cultivator. Aura-based decks want to focus on a small number of heavily enhanced creatures, so you can maximize the use of hexproof/shroud auras. Sure, this might draw you a card or two, but with a number of enchantresses, card draw is not usually a problem. Same for Snake Umbra. Armadillo Cloak is strictly better than Unflinching Courage. Not only can you put it on your own lifelink creatures for double health, you can also put it on an enemy creature to gain health when it attacks--healing off any damage it deals to you should you be the target.